Free Cloudeight Screen Savers, Free Screen Savers, "MarbleHead and Other Places"
Welcome to our "Marblehead and Other Places" Screen Saver. A little background on this screen saver. The name Marblehead comes from the town of Marblehead, Ohio (on Lake Erie) where the oldest working lighthouse on the Great Lakes still stands, guiding mariners through the often stormy waters of the lake. Other pictures in this screen saver show the "Blue Hole" (Castalia, Ohio) which is a "bottomless" pool that is fed by a subterranean river far below the surface. And Johnson's Island (Sandusky, Ohio) where a Civil War cemetery is the resting place for hundreds of fallen Confederate soldiers. Also included in this screen saver are images created by CloudEight which exist only in our minds, and now in yours! The preview above gives you tiny glimpses of 10 of the 12 images included in this screen saver. 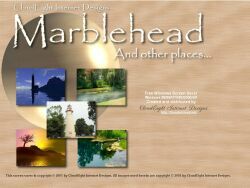 We hope you enjoy using "Marblehead and Other Places" screen saver. Thank you so much for being on our mail list! If you would like to help CloudEight by making a donation to help us continue to improve and expand our site and services and to help us keep our site free, we've made that easy to do through PayPals. Just click here or on the button below. Thanks very much! (and all images contained therein) is copyright � 2001-2002 by CloudEight Internet Designs.